Sonorous® introduces its latest addition to the LED TV furniture range - the PL 2800&2810. This Contemporary piece of furniture has been designed to support Ultra Slim LED TVs. The PL 2800 & 2810 has been developed to offer optimum viewing pleasure without sacrificing the unique Sonorous style and quality. Designed for style and engineered to perform. Contemporary design to complement any home Sturdy construction for minimum vibration Manufactured from the highest quality materials. Optimum dimensions to accommodate your AV equipment Tempered glass shelves and powder coated steel support for stylish look and maximum safety. Cable management for a tidy installation. Designed and manufactured in Europe Highly Featured. 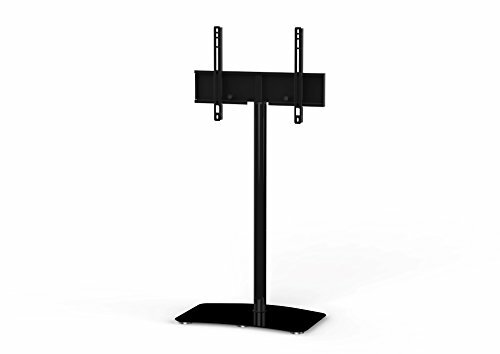 The bracket can be swiveled 45 degrees and adjusted in height (+/- 6") for an optimal viewing position. Cable management system within the integral column to conceal all connecting cables. Tempered glass for added strength.Maximum VESA Supported 600x400 to accommodate most brands of TV's Exceptional Quality and Finish All of our furniture collections are designed and manufactured to ensure highest attention to detail and quality. Our state of the art factory employs the latest technological advancements to ensure the quality of your unit, which is why for your peace of mind, we are confident to give a 1 year guarantee. Contemporary Yet Practical The supporting column gracefully leans forward to bring balance and form and offer maximum viewing pleasure All of our furniture is unique; exclusively designed and manufactured by ourselves - you will not find this combination of designs and quality under another brand.  Dimensions: 25.60" X 17.72" X 42.90"
A TV floor stand gives you easy access to all the cables and sockets when you want to change them. If you have any questions about this product by SONOROUS, contact us by completing and submitting the form below. If you are looking for a specif part number, please include it with your message.